Starring Eric Bana, Jennifer Connelly, Nick Nolte, Sam Elliott, Josh Lucas, Paul Kersey, Cara Buono, Todd Tesen, Kevin Rankin, Celia Weston, Mike Irwin, Stan Lee and Lou Ferrigno. Screenplay by James Schamus, John Turman and Michael France. Distributed by Universal Pictures. 138 minutes. Rated PG-13. Until recently, Marvel Comics have never been able to work on the big screen in the way that their chief competitor DC has. DC had the Superman movies and the Batman movies, but any attempt to start a franchise on the Marvel superheroes never quite caught on. This is changing in the last few years, with The X-Men, Spider-Man and Daredevil all getting splashy big screen adventures that were both popular and critically commended. The Incredible Hulk is arguably the biggest character in Marvel’s repertoire (only Spider-Man could deny that point.) So it was rather inevitable that a film version of The Hulk would be next to grace the multiplexes. But that is the only unsurprising thing about the making of the movie. First of all, instead of hiring a director known for his action films, they hired Ang Lee, a director known for stately art films (The Ice Storm, Sense & Sensibility, Crouching Tiger Hidden Dragon.) They hired a relatively unknown star to portray Bruce Banner (Eric Bana of BlackHawk Down) and surrounded him with Oscar-caliber actors in the other major roles. Jennifer Connelly gracefully sidesteps the clichéd elements in the character of the love interest Betty Ross. Nick Nolte gleefully chews the scenery as Banner’s brilliant but insane father. Sam Elliott portrays button-down dignity as Ross’ father, a general in charge of capturing and perhaps destroying the man his daughter loves. The screenplay is quietly thoughtful and surprisingly deep for a story of a man who when he is angered becomes a 15-foot-tall, super-powerful extension of the human id, destroying all that gets in his way. In fact, in this exploration of Banner and the Hulk’s genesis, the monster does not even appear until about halfway into the film. The Hulk, which is created by computer effects, is generally impressive, though shots from afar tend to be a little jerky and unreal. But honestly, as strange as this may be to say, the monster is somewhat secondary in The Hulk. It is more an exploration of two fractured parent-child relationships, and how the failures of those basic connections sabotage the children’s ability to relate to others or themselves. By the time, in the last half-hour or so, when Banner is tortured to the point where he reveals his darker side, the power and destruction that he unleashes on evil government figures seems not so much a cathartic action sequence. Instead, it feels like an unfair and mean fate placed on a man who is trying desperately to keep himself together in a world spinning out of control. Much like King Kong, the end of The Hulk shows an innocent beast who is placed into a strange circumstance, where all he wants is to be left alone and maybe be soothed by the beauty. Copyright ©2003 PopEntertainment.com. All rights reserved. Posted: July 6, 2003. 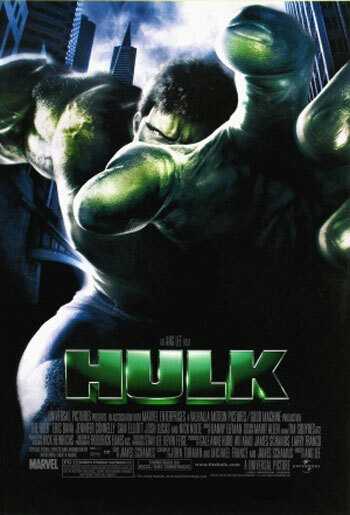 Tags: Cara Buono, Celia Weston, eric bana, Hulk, Jay S. Jacobs, Jennifer Connelly, josh lucas, Kevin Rankin, lou ferrigno, marvel comics, Mike Irwin, movie review, nick nolte, Paul Kersey, PopEntertainment.com, sam elliott, Stan Lee, the hulk, The Incredible Hulk, Todd Tesen. Bookmark the permalink.